Mocks Mill Falls was surprisingly nice for a manmade waterfall. This one is named after Henry A. Mock who built a grist mill here in the early 1800s. The first name given to Damascus, Virginia was Mock's Mill. 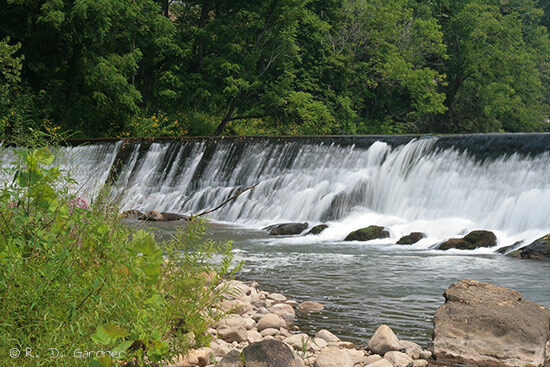 This waterfall also has a nearby geocache and is one of the eighteen in the Fallin' for Virginia Waterfalls series. The waterfall purist may turn up his/her nose at this one since it isn't a natural formation. However, you will be missing out on a beautiful area. By the numbers the G Rating was a 3 because it's a short "waterfall" but I gave it some credit for it's setting and width. The WOW Factor was a low 2. Also nearby is both the popular Creeper Trail and the Appalachian Trail. 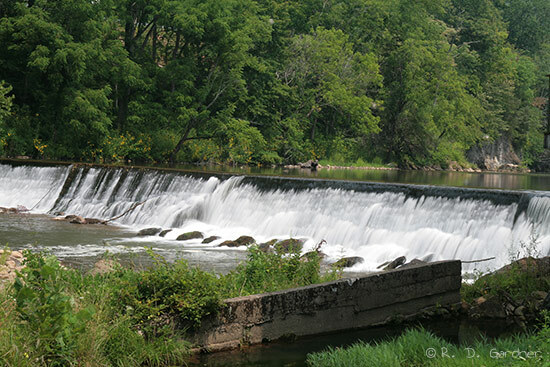 Outdoor adventure does abound in the area. Between Whitetop and Damascus, Virginia, the Creeper Trail follows several cascading mountain streams that can be quite photogenic at times. Whitetop Laurel Falls is accessed via the Creeper Trail. 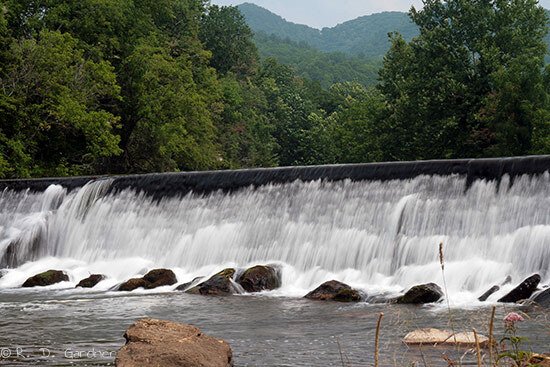 While I'm at it, let me mention a few more waterfalls in the vicinity - Straight Branch Falls, Whitetop Laurel Falls, and Alvarado Rd Falls. From Abingdon, VA, take US-58 East until you reach Damascus, VA. After crossing the bridge, take the first road LEFT. Go about a block and you'll run into the restaurant that sits in the location of the old mill. Parking is nearby behind the restaurant or you can park in the standard customer parking lot. The stream is wide here so normal composition will be landscape. In the Spring you may be able to find wildflowers to use as foreground. I couldn't find any great foreground to use. Use a polarizing filter for sure. Area is very exposed and bright. On the "bright" side you get fairly even lighting so contrast isn't terrible. I know you're gonna go into shock but I don't think a tripod is a must for this one, although I used a relatively long shutter speed. If you shoot directly upstream to capture the mountains in the background (see bottom picture on the left), be aware that there is a power line which cannot be avoided. I removed mine from the picture.